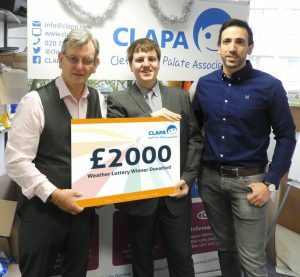 CLAPA supporter Mary hit the jackpot in late 2018 and won an incredible £25,000 through the Weather Lottery! CLAPA’s Weather Lottery is managed externally. We don’t pay a penny for the winnings, but we do receive a portion of your entry fees and put them straight to work supporting people affected by cleft. Mary has been supporting CLAPA since her grandson Sam, now 25, was born with a cleft lip and palate in 1993. 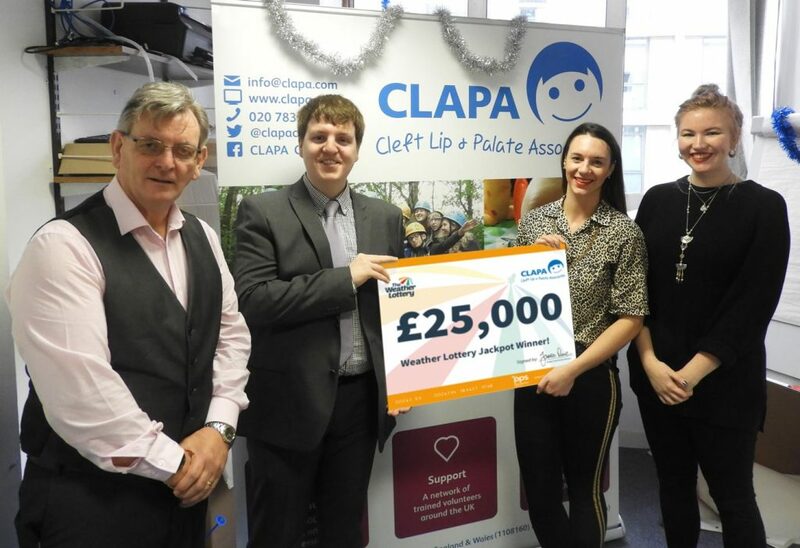 At the end of 2018 we were excited to be able to let her and her family know she had won the CLAPA Lottery. When Mary’s son Peter, along with Sam, came to collect the cheque they explained Mary was planning to split her prize money between her grandchildren. She even donated some of her winnings to CLAPA as well. Mary’s son, Peter and grandson, Sam collecting the £25 000 cheque on her behalf. In 1993, Sam was the first baby diagnosed with a cleft lip and palate at Basildon Hospital. At first, the sonographer couldn’t believe what she was seeing. She had just come back from a training course about cleft diagnosis the previous week. Expectant parents, Peter and Trish were advised to go home and not to worry. There wasn’t much chance for them to talk about the diagnosis there and then and they weren’t sure how to feel. “The whole thing was very matter-of-fact,” remembers Peter 25 years later, visiting the CLAPA office with his now grown up son. Luckily, the pair didn’t have long to wait until they were conatcted by their local NHS Cleft team, and soon after they met with surgeon Brian Sommerlad and his colleagues, including the cleft coordinator, orthodontist, and speech and language therapist. They were offered advice on what was next for the family and shown before and after photos of children who had lip repair surgery. They we’re advised to tell friends and family sooner rather than later, reduce the anxiety that keeping the news to themselves might bring. Presenting Mary’s donation to CLAPA! Sam was born by C-section and Peter is still amused to remember the confusion of medical staff approaching the subject of his cleft after his birth. Sam was born into a family of nurses and other health professionals but despite professional experiences, both parents felt emotional when it came to their own baby’s first surgery. “There were tears when he came back from his operation,” remembers Peter. Sam looked different but soon the family grew to love his new smile as much as they had loved the smile he was born with. Sam, now 25 years old recently had his last check up from his cleft team. Since that last consultation, he’s been travelling, visiting Iceland, Canada, and America. He’s saving up to travel again. The whole family were excited to hear the news that Sam’s gran had won the CLAPA Lottery. Shahir & Aadel Run a Mile for CLAPA!